This past Saturday I ran Brazen Racing’s Western Pacific Half Marathon. It was my second half marathon, coming only seven days after my first. The weather was excellent! As advertised, the course was mostly gravel/fire trail with a small portions of pavement. The course was well marked and there were plenty of volunteers to provide directions and water/sports drink along the way. The event also included a marathon, 10K, and 5K – drawing over 1500 runners in total. As is the case with all Brazen races, it was a quality event – they know how to do it right. The post-race expo was great with plenty of food and people simply hanging out. I hadn’t run a Brazen race in a few months and noticed that this time they had pacers for the half and full, which was nice. Garmin time: 1:51:42 at an 8:28/mile pace. Again, this was my second “half”, so the pressure was on to meet or beat my results from last week – pressure from myself and no one else, of course. I pretty much followed the same pre-race tapering, pre-race carbing, and mid-race fueling plans that I did for the Pleasanton Half. I also planned to follow the same pacing plan (1:49:), so I started the race with the 1:50 pace group. 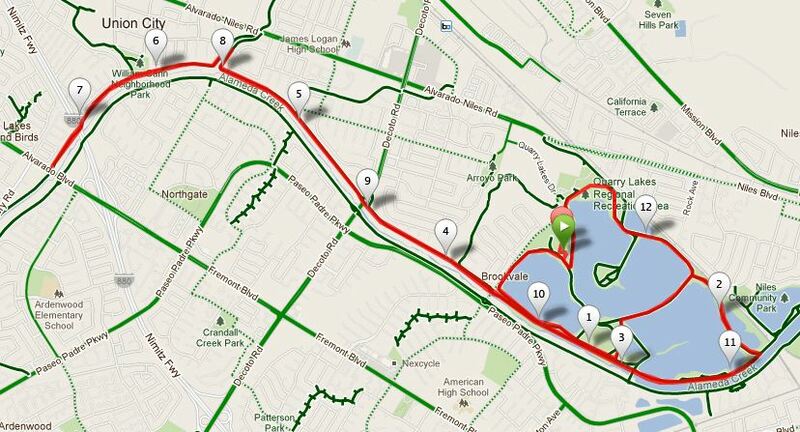 As you can see, by mile four, I dropped the plan and just ran the race/mile I was on until the final 1.1 miles. Start pace. I still start too fast for a longer race. Last week is was -:27 and -:21 for miles one and two – this week -:24 and -:14. I knew I was running too fast (by feel and watch) and, in my head as I ran, I could hear that part of the movie Without Limits where Bowerman and Prefontaine argue about negative splits. must. do. better. in. this. area. Shoes. I need to get trail shoes. After about mile eight, I could pretty much feel each rock pebble on each footfall. I love my Reebok RealFlex Runners and they did fine for the 3 to 4 miles of trail in last week’s half, but they are NOT trail shoes and 13.1 in them was too long. Investment in trail shoes on the horizon. Frequency. Doing two halfs in as many weeks may not be the best thing – at least at this point in my training. I did well on both, but in the long run (running actively the rest of my life), I probably need to throttle back or at least bow out if I have a “crick” or something. That said, would I do it again – probably; though quality of the race needs to trump quantity. So, half marathon number two is in the books! As with #1, it was a learning experience and further reinforced my love of running. For my post-race meal, I risked pink slime and downed an Angus Bacon Burger and fries from McD’s – CHOMP!